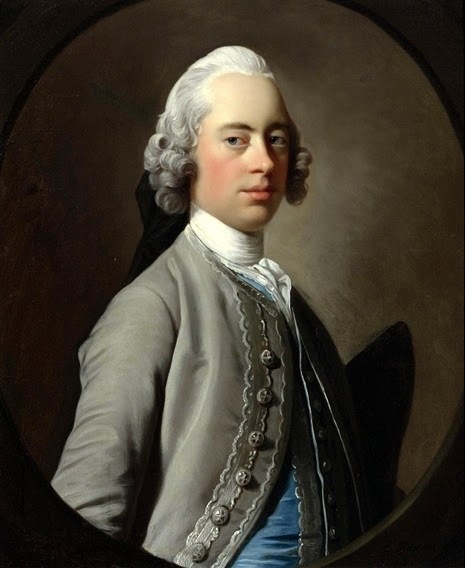 My fourth great uncle Karl Heinrich August Mainwaring was the tenth of the seventeen children of Rowland Mainwaring (1783-1862), eldest of the eight children of Rowland’s third wife Laura Maria Julia Walburga Chevillard (1811-1891). Karl Mainwaring was born 4 September 1837 at Mannheim in Germany. He died 21 August 1906 at Saint Helier, Jersey. On 19 September 1856 Karl Mainwaring appointed as lieutenant in the Royal Navy. From 1874 to 1893 Karl Mainwaring was harbour master in Kingston, Jamaica. He retired from the navy with the rank of captain. 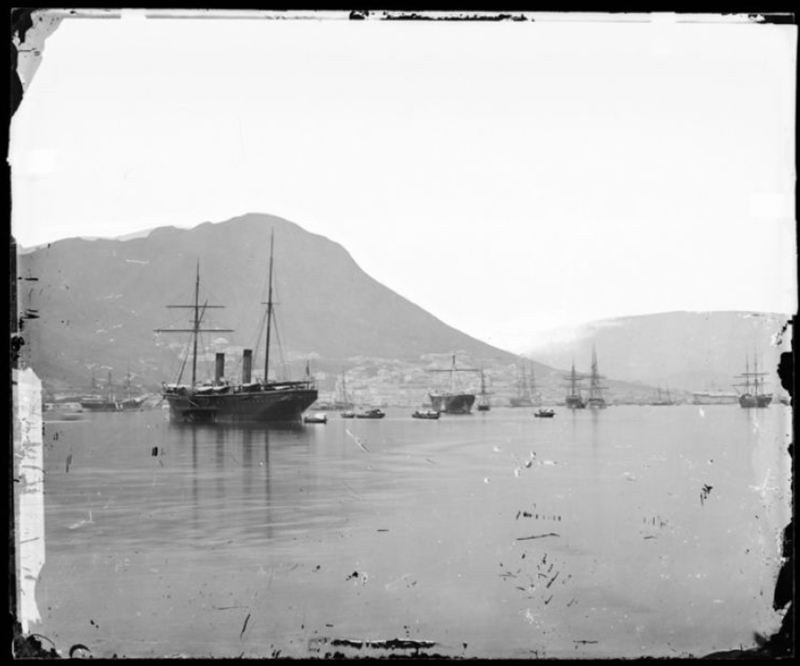 In 1866 Lieutenant K.H.A Mainwaring was stationed in Hong Kong with the China Squadron on HMS Princess Charlotte. Xiānggǎng is the modern transcription of 香港 , Hong Kong, ‘fragrant harbour’. 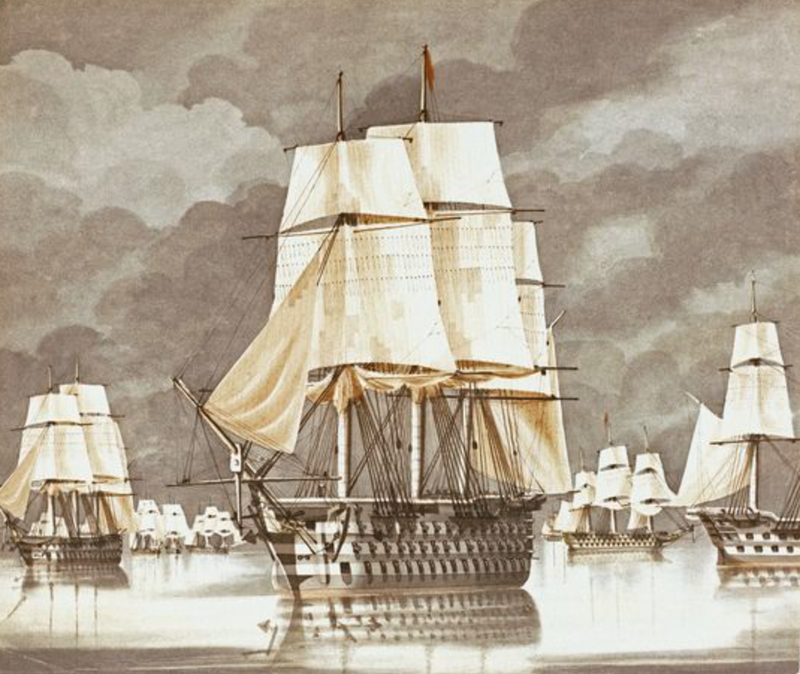 HMS Princess Charlotte was a 104-gun first-rate ship launched in 1825. Once the the flagship of the Mediterranean Fleet, from 1858 until she was sold in 1875 the Princess Charlotte was used as a receiving ship, a harbour-bound hulk used for stores and accommodation in lieu of a permanent shore base. Kellett’s Island, looking west across Wanchai towards Central and the Peak, with HMS Princess Charlotte on the right (1869 – 71). Retrieved from Cheung, Tim. “Maritime Museum to Show Historical Pictures of HK.” Artinfo. BlouinArtinfo Corp., 15 Jan. 2014. W <http://hk.blouinartinfo.com/news/story/983316/maritime-museum-to-show-historical-pictures-of-hk>. 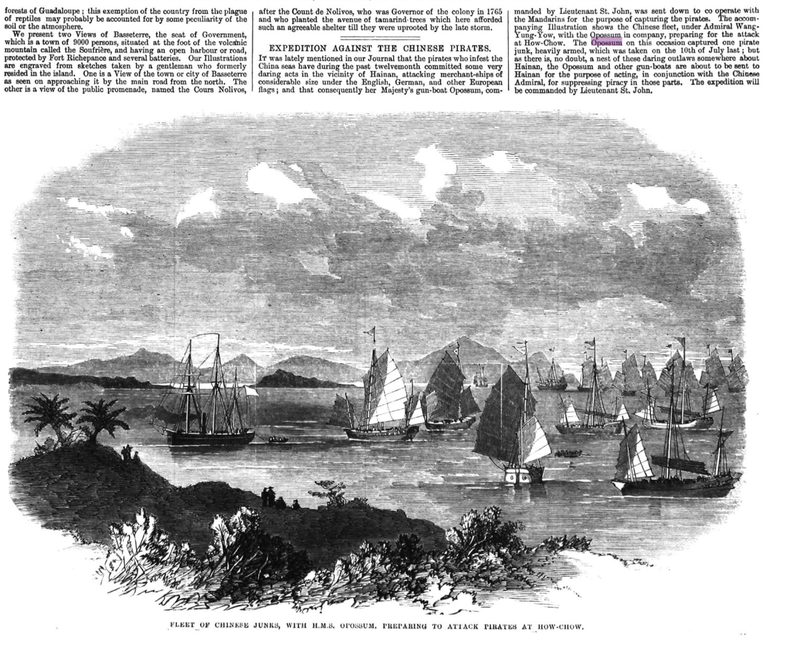 Hong Kong Harbour about 1868 from The China Magazine Midsummer Volume 1868, page 88, digitised by Google books. The view possibly shows Signal Hill. In July 1866 Lieutenant Mainwaring was given charge of HMS Opossum. 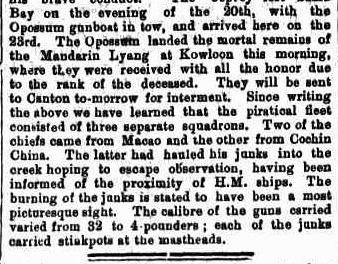 In 1865 HMS Opossum had been engaged in attacks on Chinese pirates in co-operation with the fleet of the Manchu Qing government. 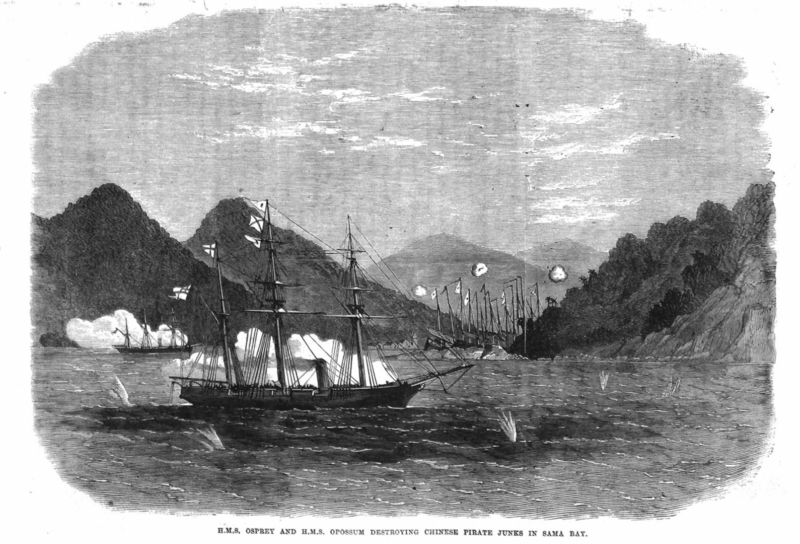 The attacks were reported in The Illustrated London News of 23 October 1865. 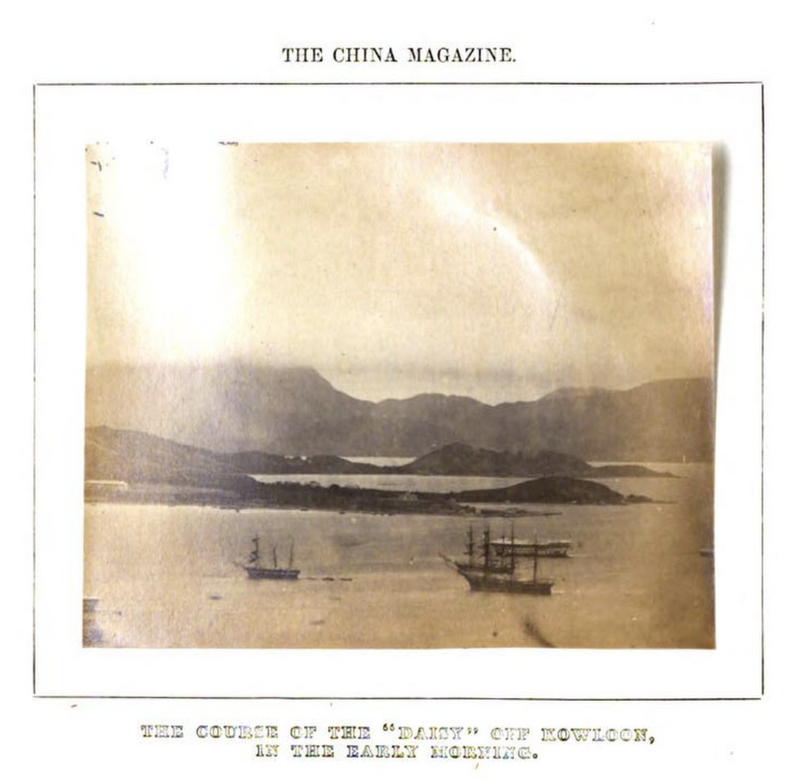 On 18 July 1866 HMS Opossum, commanded by Lieutenant Mainwaring, together with HMS Osprey attacked pirate vessels in Sama Bay, now known as Sanya Bay on Hainan Island, 250 miles south-west of Hong Kong. The British destroyed 22 Junks and 270 cannon and killed about 100 men. HMS Opossum was a wooden screw gunboat of the Albacore class which carried about 38 crew and four guns. (In the 1866 Navy List, the Opossum is listed as a tender to the Princess Charlotte and Mainwaring is in charge of the Haughty, also an Albacore class wood screw gunboat.) HMS Osprey was a Vigilant class gunboat with about 80 crew and four guns. 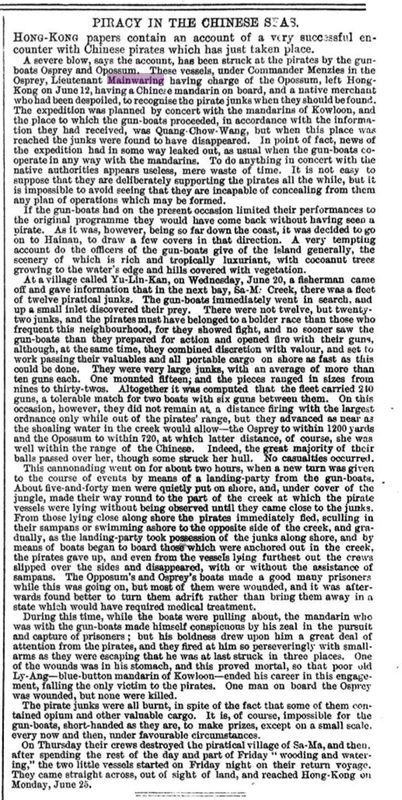 The attack on the pirates was reported in The Illustrated London News of 22 September 1866 and followed up with an illustration the following week. The 1866 engagement with the pirates was widely reported. The following account is from the Melbourne Leader. Sir Henry Mainwaring (1587-1653) was an English seaman who spent some of his career as a pirate on the Barbary coast. He was afterwards pardoned and knighted by King James. My son, who is studying history, came across the pirate Henry Mainwaring and asked if we were related to him. I replied that I did not think so, but I decided to check for a relationship. Henry Mainwaring, I discovered, is my third cousin eleven times removed, a relative indeed, though not a close one. The common ancestor of me and the pirate is Sir John Mainwaring (1470-1515) my 13 times great grandfather. 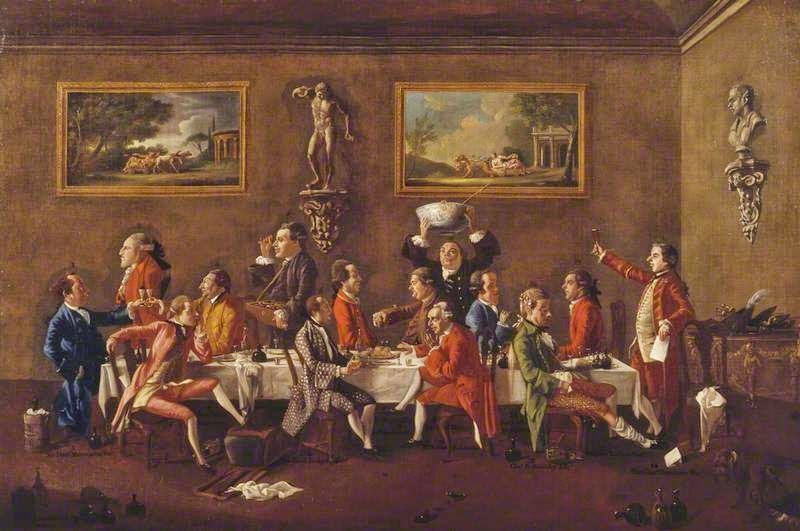 Sir John had gone to the French wars in the train of the Earl of Shrewsbury. He was knighted at Tournai in 1513. ( Metcalfe, Walter Charles, ed., Book of Knights Banneret, Knights of the Bath et., IV Henry VI to 1660, London (1885) page 50 ) Sir John Mainwaring was Henry Mainwaring’s great great grandfather. Henry Mainwaring was the second son of Sir George Mainwaring and Ann More. Henry studied at Oxford University. In 1604, about seventeen years old, he was admitted to the Inner Temple as a lawyer. It is not clear how Henry became a seaman, but in 1610, at the age of about twenty-three, he was commissioned by the Lord High Admiral, Charles Howard, 1st Earl of Nottingham, to capture the pirate Peter Easton, who had been raiding Newfoundland. Mainwaring was unsuccessful. 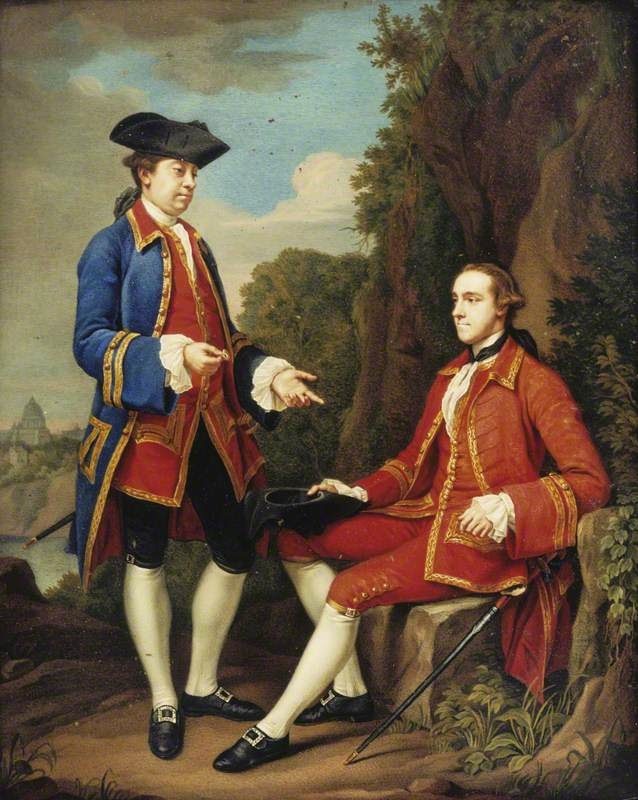 He was then given a letter of marque, becoming a privateer against Spanish shipping in the West Indies. En route there he decided instead to attack Spanish shipping from the coast of Morocco. Mainwaring was based at La Marmora, present day Mehdya, on the Morocco coast near Rabat, for four years from 1612. He had a fleet of thirty captured Spanish ships. He claimed that he never attacked English ships. The French and Spanish governments complained about Mainwaring to the English government and King James I sent an envoy with an offer of a free pardon if he promised to give up piracy. He was pardoned in 1616 and all those who served under him were granted an amnesty. Later, Mainwaring became a hunter of pirates. He wrote a book on piracy, Discourse of Pirates, which he dedicated to the King. He was knighted on 20 March 1618 and became one of King James’s courtiers and a friend of the King. In 1620 he was appointed Lieutenant of Dover Castle and Deputy Warden of the Cinque Ports. In 1621 he was elected Member of Parliament for Dover. Around this time Mainwaring wrote the Seaman’s Dictionary. It was not published until 1644 but manuscript copies were distributed before then. 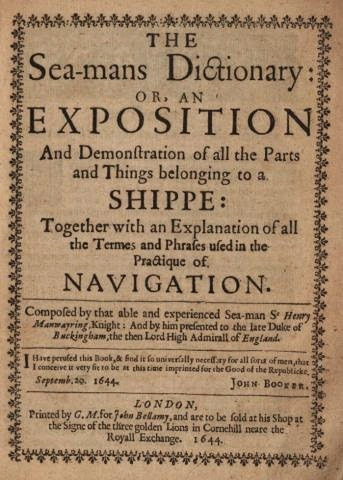 It is considered the first authoritative treatise in seamanship. Mainwaring offended Lord Zouche, Lord Warden of the Cinque Ports, and was dismissed from his post at Dover Castle. Mainwaring sought the patronage of the Duke of Buckingham. At that time Buckingham was Lord High Admiral and it has been asserted that Buckingham and his masters made a serious attempt to reform the naval administration, and that in this Mainwaring played a considerable part. However Buckingham was assassinated in 1628 and Mainwaring lost his patron. Mainwaring was not wealthy, and after Buckingham’s death, he attempted to improve his fortunes by marrying a rich widow. 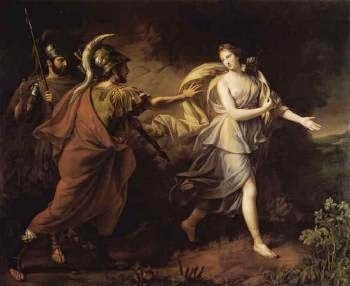 She rejected him and in 1630 he eloped with a twenty-three year old heiress. His father-in-law refused to provide a dowry until Mainwaring had made a settlement. 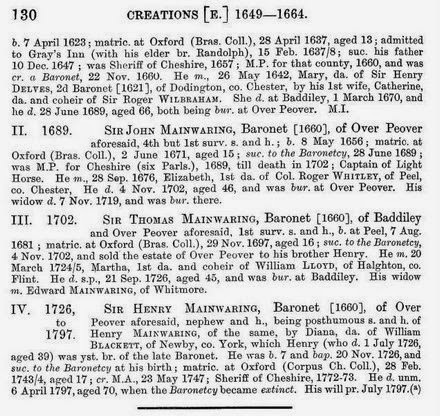 Mainwaring’s wife died in 1633 and their only daughter died about 1640. 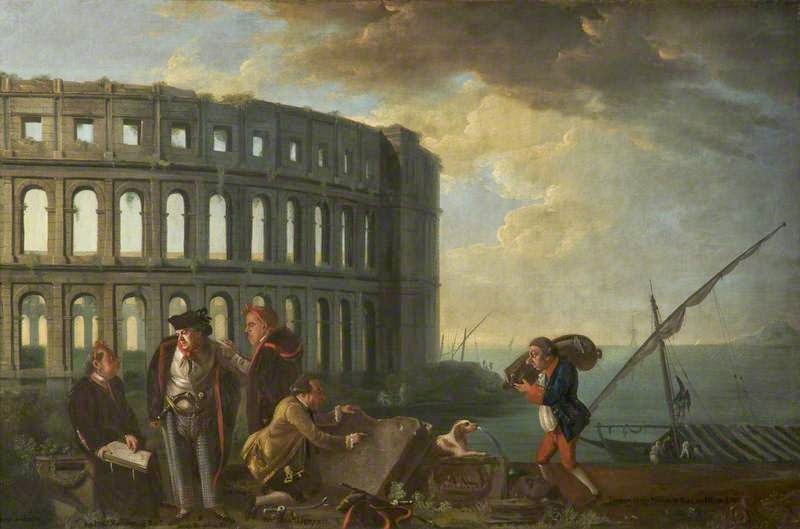 Mainwaring was outlawed for debt in 1641. In 1651 an assessment of his worth in considering his debt stated that his entire property consisted of ‘a horse and wearing apparel to the value of £8’. Mainwaring had joined the navy as a captain in 1636. He was a Vice-Admiral by 1639. During the English Civil War (1642-1651), Mainwaring joined the King at Oxford. Later he served with Royalist fleet. He was with the sixteen-year-old Prince Charles, later King Charles II, at Jersey in 1646. Mainwaring died in 1653, leaving no will. He was buried at St Giles, Camberwell. No gravestone, if there was one, has survived. E. Hunt, “MAINWARING, SIR HENRY,” in Dictionary of Canadian Biography, vol. 1, University of Toronto/Université Laval, 2003–, accessed March 20, 2014, http://www.biographi.ca/en/bio/mainwaring_henry_1E.html. “SIR HENRY MAINWARING. *.” The Spectator Archive. The Spectator, 19 Feb. 1921. Web. 20 Mar. 2014. <http://archive.spectator.co.uk/article/19th-february-1921/19/sir-henry-mainwaring>.